So, you should know by now that I am a fan of design. When a product is designed to perfectly suit the user and their context and *still* looks good... well, I am truly an admirer. It's green in both its tech and its design. And it's downright futuristic-looking. Right?! The thing actually folds into a compact little unit! The rims are not standard. They have different hole placement and they are a really sturdy 3 wall extrusion rims. The Gi it's not an off-road bike but it can handle pretty strong hits without a problem. Also the spokes are not particularly standard but they can be handled with standard tools. For replacement we will make available all you need. And any shop will be able to replace parts. Maintainable will not be a problem at all. We want to make the Gi a problem solver and not an other thing to be worry about. 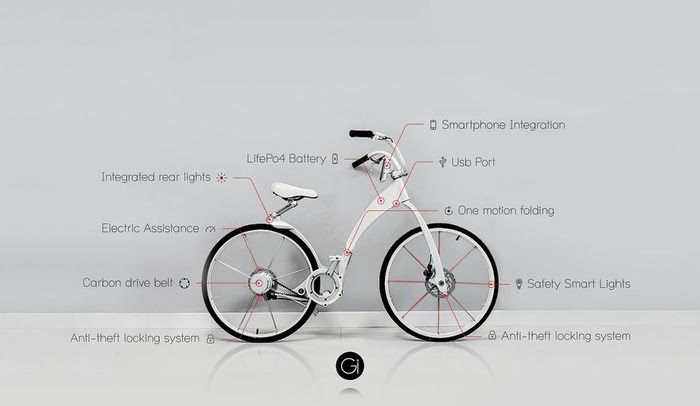 This week, Gi Bike just launched their KickStarter campaign. So if you want one of these at a discount, you might want to get in on the action. They're looking to raise $400k, and after 2 days are off to a good start with over $20k raised. In fact, as I was writing this, the ticker was going up in real time (first time I saw that happen, very kewl indeed). As for me, well truth be told: I am soooo not the target market for this gorgeous piece of machinery. Nowhere in my budget will there ever be room for a $2000+ bike, let alone a $3000+ electric version. But if there were... rest assured that this is the one I would likely be longing for. (Ok, I already long for it :) Thankfully, there are smaller pledge ranges for us supporters who can't shell out the full amount. Check it out in action and then head over to the Gi Bike KickStarter to find out more.